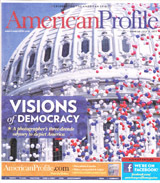 While a popular American axiom declares “a picture is worth a thousand words,” photographer Joseph Sohm discovered he had to take thousands of pictures to capture the idea behind a single word: democracy. A former American history teacher and musician who grew up in Webster Groves, Mo. (pop. 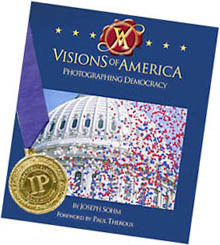 22,995), Sohm began his photographic odyssey during the early 1980s as America approached the 200th anniversary of the U.S. Constitution. Inspired by the Founding Fathers’ foresight to establish a republican form of government that derives its power democratically from the people, Sohm began snapping images that reflect that idea. …Sohm’s book continues its world travels with a stunning afterlife, including a symphony written for it, which many say has never been done before. 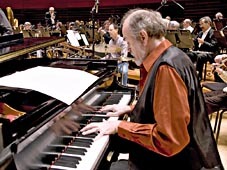 His eye-popping collection of some 1,300 images has inspired the symphony composed by Ojai’s Grammy-winning musician Roger Kellaway, as well as the lyrics to a new song: “We The People,” penned by Oscar-winning duo Alan and Marilyn Bergman. Art Beat caught up with Sohm outside the Newseum. The old adage that a picture is worth a thousand words may indeed be true, but photographer Joe Sohm has found that it has taken him thousands of pictures to capture just one word: democracy. 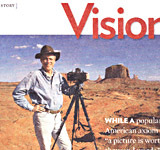 Sohm's over thirty year journey took him to all fifty states where he found and photographed everything from the president in the White House to the homeless of Beverly Hills. Table Book,” one of 65 categories within which the 4,090 books entered were judged..
Ojai is known near and far for inspiring great works of art. That claim to fame struck again in a major way two weeks ago — on the national stage — thanks to the collaborative genius of two seriously creative local citizens along with the help of a few of their well-known friends. 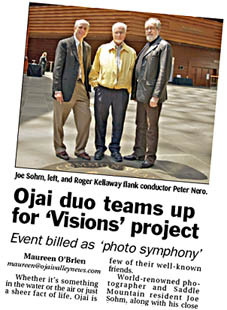 World-renowned photographer and Saddle Mountain resident Joe Sohm, along with his close friend and Ojai neighbor, the legendary jazz pianist and Grammy Award-winning and Oscar-nominated composer, Roger Kellaway, have just returned home from Philadelphia, where they debuted their masterpiece. Titled Visions of America, their homegrown precious gem was a sold-out multimedia extravaganza of image and sound in celebration of democracy that quite aptly made its world premiere just days after President Obama’s inauguration and in a venue just a few blocks away from the Liberty Bell.